Just think about all the splinters. 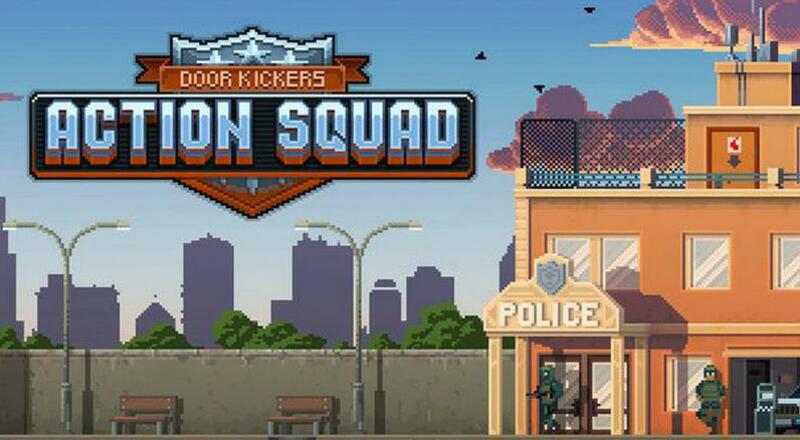 Door Kickers: Action Squad originally forced its way onto PC back in November of 2017. Since then, it's puttered around Steam's Early Access program, presumably waiting for someone to figure out the best CQC puns to use in its release announcement. The good news here is that Action Squad got a full release just a couple days ago. The bad news is that the release trailer has eschewed all those sweet, juicy puns in favor of actual information on the game's playable characters. Sounds like a bad decision, personally, but I'll let you be the judge. Action Squad, which is out now on PC, serves as an offshoot of Killhouse Games' Door Kickers franchise. Whereas the first Door Kickers is more of a tactical brain-twister, Action Squad is focused on, well, action. You'll be busting down doors, blasting bad dudes, and saving hostages, all in pixelated, two-dimensional glory. You'll also be able to bring a buddy throughout Action Squad's 60 levels, as the game supports two player co-op of both the local and online varieties. We took a look at an early version of Action Squad right after it hit Early Access, which you can see below (or go to the corresponding article here).